Apple has officially seeded and released yet another second beta version of iOS 8.3 Firmware i.e. iOS 8.3 Beta 2 (Build: 12F5037c) and Xcode 6.3 Beta 2 (Build: 6D532l) Updates for iPhone, iPad, iPod Touch and Apple TV devices to all iOS developers and non-developers for experimenting and testing of various features and functions. The Direct Download Links of iOS 8.3 Beta 2 .IPSW and Xcode 6.3 Beta 2 .DMG Files for iPad Air 2 6G, iPad Air 5G, iPad 4G, iPad Mini, iPad Mini 2, iPad Mini 3, iPad 3G, iPad 2G, iPhone 6 Plus, iPhone 6, iPhone 5S, iPhone 5C, iPhone 5, iPhone 4S, iPod Touch 5G and Apple TV 3G are available instantly for upgrade / update / manual installation purpose. Apple has brought several new changes in features and functionalities of iOS 8.3 Beta 2 (12F5037c), The official release notes includes; 300+ New Emoji Pickers with 30+ New Country Flags, Wireless CarPlay Support Fixes, Apple Pay for China Union Pay Support, iCloud Photo Library Drops Beta Tag, Google 2-Step Verification, iCloud Drive and CloudKit Bugs Fixes and Performance and Stability Improvements. According to report and sources, it’s further expected that, iOS 8.2 Final Firmware Version will be released sometimes in next week. The official release notes of Xcode 6.3 Beta 2 (6D532l) contains; Swift v1.2 programming and iOS 8.3 Beta 2 SDK and OS X 10.10 SDK for Mac, iPhone, iPad and Apple Watch for applications development. 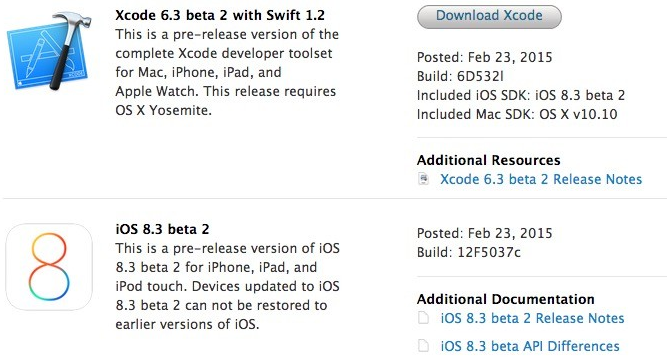 How to Install iOS 8.3 Beta 2 and Xcode 6.3 Beta 2? Apple iPhone, iPad and iPod device users can receive iOS 8.3 Beta 2 OTA Update (Over-the-Air) through Settings > General > Software Update option. All iOS developers can visit iOS Dev Center website to get official iOS 8.3 Beta 2 Downloads. All iOS non-developers (general public users) can manually install and activate iOS 8.3 Beta 2 via iTunes without UDID developer account for Free. Download Xcode 6.3 Beta 2 DMG and iOS 8.3 Beta 2 IPSW Files for iPhone 6 Plus, iPhone 6, iPhone 5S, iPhone 5C, iPhone 5, iPhone 4S, iPod Touch 5G, iPad Air 2 6G, iPad Air 5G, iPad 4G, iPad Mini, iPad Mini 2, iPad Mini 3, iPad 3G, iPad 2G and Apple TV 3G via Direct Links appeared below. How to Jailbreak iOS 8.3 Beta 2? Currently, Untethered Jailbreak iOS 8.3 Beta 2 Using TaiG, PanGu and 25-PP Jailbreak Tool is not possible.